As I was reading Matthew 13:10-17 in the MSG bible this weekend I realized something that I want you to experience with me…we are special to God! There is something about you that the Lord was interested in when he began to fashion you in your mothers womb. He desired to be in fellowship with each of us. He told stories to bring us close to Him. The disciples were somewhat amazed at the way Jesus told His story. Why do you tell stories they’d say? And that is when Jesus told them about themselves. You’ve been given insight-you know how it works. Not everyone has this gift, this insight. The reason that there is confusion, chaos, depression, doubt and unhappiness around us today is because people are different. Some have been lit up and others are still in the dark. Some people will discover the secret to fulfillment and success and others will not. The difference: God given insight! The key factor to getting His insight to flow in us and through us is to have a ready heart. A ready heart is a heart that beats for Him. Ready hearts are the seed bed for free flowing divine insight. 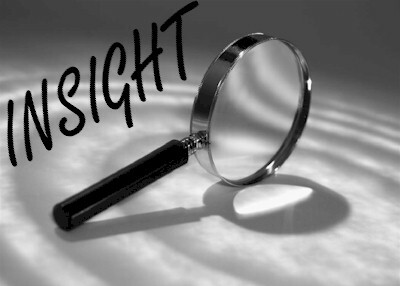 Insight has to do with revelation or sight for the heart! You want more revelation from God? Have a ready heart. Want a deeper level of understanding concerning the things of God? Again, all it takes is a ready heart. Jesus said that he used parables…life stories to help create this readiness and nudge people towards the insight that is necessary to navigate their lives. My prayer is that His stories, the Bible, will create a readiness in you and nudge you closer to His divine insight. The easiest way to get through the daily grind is to accept what He said about you today...YOU can do this...you have been given insight...YOU KNOW what to do! Now go and do it!